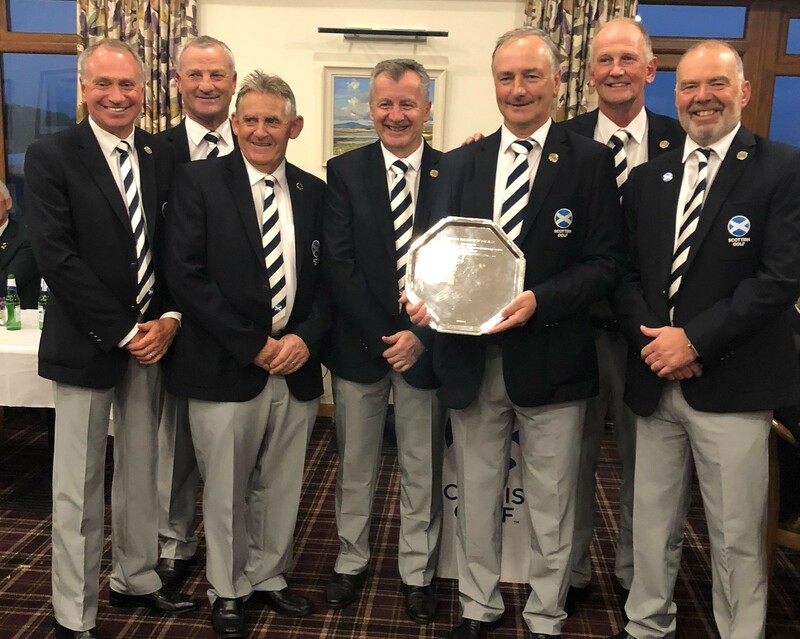 Scotland have been crowned Senior Men’s Home Internationals champions at Southerness Golf Club once play resumed following a visit from the uninvited Storm Ali. After losing the second day’s play due to the extreme weather conditions, a change to the original format was agreed with two sessions taking place on Thursday, which consisted of seven head-to-head battles, ensuring all three country versus country matches were played. In the round robin format, Scotland, England & Ireland all won two out of three matches, so the title was decided on total game points scored across all three matches. On the final day, it was Scotland who turned on the style, losing only one match from fourteen. In the morning session, the hosts defeated England 5-2 with Ireland getting the better of Wales by the same scoreline. The morning’s battle with the Auld Enemy was a close affair. Scotland lead England 3-2 with two matches on the course, but 4&3 victories from both Malcolm Reid and Captain Ian Brotherson closed out the match. With it all to play for in the afternoon matches, England convincingly defeated Ireland 5.5 – 1.5, whilst Scotland took charge early on against Wales and never let up, winning 6.5 – 0.5. When all was said and done, it couldn’t have been closer, with the winner decided by the team with the highest number of points scored across all three matches. Scotland totalled 15 points, England 13.5 and Ireland 12, meaning Scotland were crowned champions for the first time since 2014, which was also on home soil at North Berwick. Photo shows the Scotland team with the trophy.